When we decided to travel, we chose to replace a home with another home. Long winters, rainy days and everyday life seemed unpleasant in tiny trailers. We already owned the Bug and wanted to bring it along for the ride, so we had to design a pull-around-home light enough for the Bug but comfy enough for us. After researching, we chose a builder who got so interested and excited about our trip that he let us be in on every step of the build, making lots of small detail decisions. The total cost of the project was around $4,500. We are still in touch with our builder and he helps us out virtually when we have an issue with something. Our camper is pulled by our 1981 VW Bug that gets a lot of attention from bystanders. At first, it made us shy, but now it makes us proud. The engine is carburetor based, 4 cylinders with 1300cc. It's original, and even the pieces that have been replaced along the years and miles have always been original to the engine. With low horsepower (46), it pulls along our home, which weighs about 1,300 pounds. We lived together in a small house in a small coast town in Brazil, three hours south of Rio de Janeiro. I was a tour guide and Jor was an on-board photographer for a schooner that went around islands and white sandy beaches. Whenever we could, we would do kayak trips, bus trips, hiking trips and any other sort of travel. Together with Leia, our dog, we would experience the outdoors as much as possible. Both of us were raised in cities, went to college in even bigger cities and had office-based first jobs (tourism and hospitality). Why did you decide to travel and live small? Jor left Buenos Aires and met me in Brazil during a six-month trip with her friend Sole. Both of the girls were traveling but decided to stay for the summer in my hometown. The summer turned into a year, and our dating led to us living together eight months later. Since our beginning conversations, we realized we both loved traveling but we did only on holidays, weekends and day trips until it was not enough. Already living together, we came up with the idea to have a small house pulled by our VW Bug. An idea that began as a three-month trip, then six, ending in an empty horizon with unlimited time frames. Together, we chose our favorite and most practical clothes and necessary appliances and sold everything else we owned. What we could not sell we gave away to friends and nonprofits. It took us six months to get everything ready to go, from the design to the road, and even after that many details and adjustments continued. We added details like a paint job, fridge, gas bottle, appliances and toilet, which cost around $1,000. After that, we left Buenos Aires. We also had a crowdfunding campaign that gave us $1,500 so we could purchase a solar panel, batteries, converter, led lights, etc. Aboard our home, we have 97% of our belongings: books, clothes, food, kitchen, living room, beds, solar panel, batteries, liquid gas, fridge, bathroom with toilet, water compartment and even a spare tire. The other 3% is carried on top of the car, which includes two petrol containers and a folding bicycle (for moving around small towns and getting some exercise). When we arrived home for the first time with our trailer, we realized our storage area was about one-third of what we had thought. So we gave away more stuff. We kept one small box for essentials and one for irreplaceable items. At first, it was hard to get rid of the "maybe I need it" or "sometimes I use it" things. But we eventually got around to it. We were a bit concerned about living in such a small environment, the three of us. But after the first 100 miles, we were able to park anywhere with a beachfront, lake or riverside view. We were sure of our decision, and the need for any more square footage of living space was gone. Once we left our home and started driving, we were extremely happy but we were also amateurs. So we didn't check on things; we didn't know how to fix many things and didn't have the right tools. On the second day of our trip, our trailer's left wheel went loose—because you are supposed to check them after the first couple 100 miles and we didn't know that. We asked for help and a couple hours later, we were on our way. That was the first lesson we learned on our trip: ask for help when you need it. People naturally have the instinct to help each other, especially on the road and in the countryside. But the most important lesson we learned was to deal with problems, as a couple, as a team and as partners. Jor makes scrapbooks, postcards and fridge magnets, which she sells to stores or open fair markets along the way. I am a trip leader and I travel around Brazil and Patagonia with an American travel company. I work as a guide two weeks, four times a year. During those two weeks, Jor stays somewhere and I travel around with a group and come back home with goods. The most important detail to our finance though is not income, but outcome, since we spend about half of what we did living in a home. Our biggest expense is gasoline and food since water and energy are provided by nature. We don't pay rent or camping fees since we sleep in parking lots—natural or man made—and when we're in cities, we try to park at people's houses, which we find through websites like couchsurfing.com. Mate-Tea Drinking Gear: As traditional Argentinians, we drink our daily herbal tea, the Mate. We drink it in a special cup with a straw and it is an essential ritual of our driving routine. Besides driving, we also drink it while hanging out or when we meet people on the road. With its acquired taste, it provides no other effect besides hydration and antioxidants. But the most important aspect is sharing it with others. Fully Loaded iPod: Our iPod contains everything from Bolivian folk music to Brazilian samba or even American rock, as our moods also range from spiritual to philosophical to chill. Music is essential. "Essen" Oven-Pot: This is a magical cooking device—a cooking traveler's best friend. What do you eat when you're on the road? Our diet hasn't really changed that much since we started to travel. This is mainly due to us having two stove burners and a magic oven-pot, which we use to make bread, pizzas, homemade marmalade and even cakes. We also have a fridge, so that lets us save leftovers and keep veggies, dairy products and meat. That being said, when it has been a long day, our traditional quick meal is macaroni and cheese. That will never leave you hungry. One of the coolest things about traveling is also trying local food, so we do this as much as possible and even experience jams and recipes with local products. Although we try to eat healthy, we have ended up eating at fast food joints or having a hot chocolate with a slice of cake (as we are doing while we are writing this). How has your relationship changed since you went mobile? 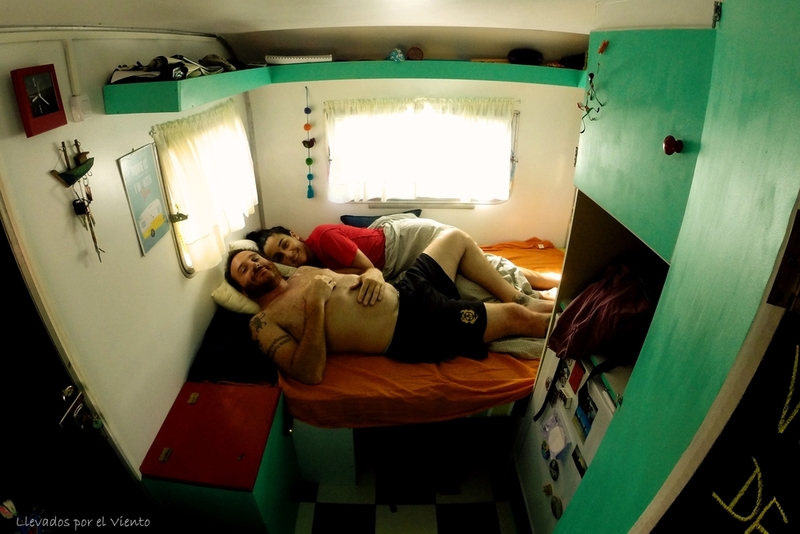 Living in a small environment helps us learn more intimate details about each other. Sharing a small space 24 hours a day means no secrets or mysteries. We went "all in" when we decided to get married halfway through our trip. We became not only lovers and friends but also partners who had to deal with mechanical issues and rough weather conditions. Our relationship is now at another level. When Jor and I met, I already had a one-year-old dog (now four years old), and we had to talk it over before deciding if she was going to join us on the trip. But after getting some dog-traveling gear and acquiring all the regulations, we didn't look back at the option of not taking her. She is our third and extremely important team member. In a year, Leia has been hit by a car in Patagonia and attacked by a mad group of dogs at Iguazu Falls, and her little house (that goes in the front of the trailer home when parked) was blown by the extreme Patagonian winds twice. However, she has learned to swim; play on the sand, snow and glacier rivers; eat all kinds of fruits; make hundreds of dog friends; experience who knows how many new smells, and more than anything, never left the side of her caretakers. Traveling with a dog limits your travel life or at least makes it more complicated (national parks, border crossings) sometimes not letting us go to places or forcing us to look for solutions. We learned to let go of material things: Having less is having more, and having the right thing is better than having many useless things. We also learned to value moments more than landscapes, which are amazing. But once you have seen a dozen beautiful beaches and snowy mountains, you cherish the moments, experiences, people and adventures. 1) Ask for help when needed. The universe doesn’t conspire against you and your dreams. There are actually more people out there willing to help than those unwilling. 2) It is not possible to do everything. Life is about choices, and we should not regret them when they feel right. Sometimes you make a turn to go somewhere instead of another place and you always wonder about missing it. It is ok; life is about living, not about acquiring destinations on a checklist. What's the most rewarding thing about the way you live? We have had all kinds of wildlife camping experiences, seen beaches in Brazil, slept with the noise of the waves under the shade of palm trees, ate freshly fished meals and in Patagonia, crossed an enormous and amazing set of mountains with fresh glacier water running by us. These kinds of experiences are what we most enjoy, although it is nice from time to time to connect to the Internet, talk to friends and family and go online and read other tiny traveling home stories. We don't enjoy stopping in big cities, since we find them noisy, hard to park and unsafe, but we do understand the need to sometimes stop and make the most of its facilities and services. It hasn't been all easy and uneventful. We have had our bad days and stressful moments. But they make us stronger as a team and more realistic, better travelers. We're fearless of challenges and we don't think about quitting. Living and traveling has many restrictions or limitations that you have to accept. Jor's access to proper bathroom facilities, beauty parlors, a "good enough mirror" or a basic hot shower has not always been there. Also the limited living room space makes the living experience more intense than anything we have done before. There is no couch to sleep on if you have an argument; you just have to settle the argument and that is that. There is no way or place to ignore or avoid each other. Respect for each other's personal space and moods has become extreme. What advice would you give to others looking to live small and travel? Go for it. There is no perfect moment to begin and there is no way to be 100% prepared, you have to start and adjust as you go (with the minimum basic preparation). The most important and most difficult moment is the beginning, letting go and letting yourself go. As humans we tend to resist change and we love our comfort zones, so it is extremely difficult to jump into an uncertain daily life. But we promise that it will be so rewarding that it will change your life forever. Will you go back to your previous way of living? There is no way we could go back to our previous life, as we have changed what we value, how we see things and the rhythm of our daily life. Making changes is a slow process, and we love the process that brought us here. We don't look back with regrets and instead with happiness. Right now we are in north Patagonia, seeing snow on the mountains, taking ice of the windshield of the car in the morning and using all of our warm clothes—even Leia. The arrival of winter has tempted us to just hang around here (instead of traveling through icy and snowy roads), let the snowy season go by and enjoy the moment. All photos credit to Gonzalo Trama.